The Silverstone Stowe GMT is an impressive 48mm steel chronograph which features carbon elements. The sporty black carbon dial is adorned with yellow numerals, chrono and minutes counter’s hands. The watch also shows a double-disc date and a GMT function displayed by the central GMT hand and the green scale on the aluminium and carbon fiber bezel. The Silverstone Stowe GMT also offers a sophisticated flyback function. It enables the user to reset the chronograph to zero without stopping it. After releasing the flyback pusher, the second hand will restart immediately from zero. The flyback function allows the user to start re-timing quickly within one push of a button. It was originally used by pilots. 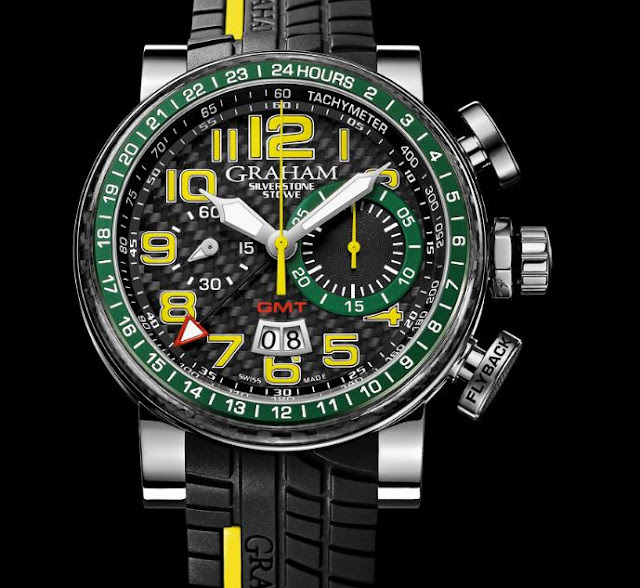 The transparent case back allows the wearer to enjoy the work of the manufacturing automatic mechanism G1721 movement, with a frequency of 28,800 vibrations per hour, and a power reserve of 48 hours. The calibre is equipped with hours, minutes, seconds, chronograph, date display, second time zone and of course, those flyback functions. No racing suit would be complete without the special tyre tread strap. The yellow inset on the strap repeats the dial motto of the Silverstone Stowe. 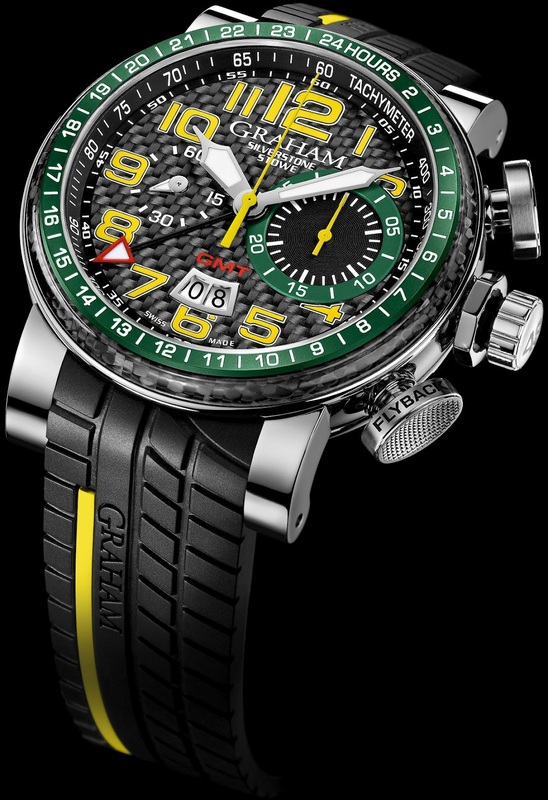 This watch knows all about endurance and will undoubtedly finish on the podium.